The Kindy Pak swing set is a fantastic swing set for a family that does not have a large backyard, or who wants to save on expenses, but still wants to give their child an outdoor play area that they will really love. It has room for three different swings. The ones shown, from left to right, are the Molded Seat Swing, Back-to-Back swing and the Half Bucket swing for babies and toddlers. Ever wonder why kids who stay in all day get grumpy to the point of not liking anything or wanting to do anything? It's an awful time for kids and their parents, right? It happens because outside physical play is a real need for a growing child - not just a want. Parents can provide for that need by placing outdoor toys right in their backyards. 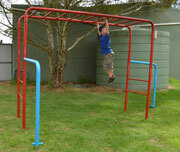 The Kindy Pak swing set is an affordable option to give your kids the outside physical play they need. An added benefit to the Kindy Pak swing set is being able to switch out the type of swings you have. So, if you need another swing that accommodates two kids at a time, you can order the Duo Seat and if you need to turn it into a punching bag, trapeze ring or a standing board when your child gets bigger, we offer those too! Or you may want to add a spring rocker or two if you are designing a daycare or preschool playground area. 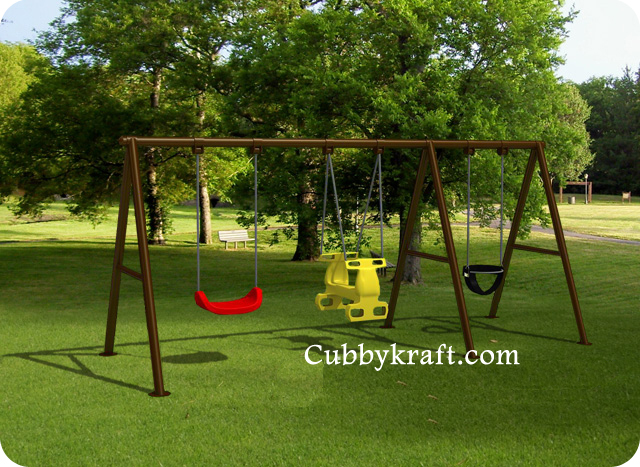 At CubbyKraft we offer all kinds of outdoor toys to add to your possibilities so you can design the perfect playground for your kids. Our Kindy Pak Swing Set is easy to install as it comes with a manual that contains a systematic process of putting up this particular swing set. Do-it-yourself consultants are always available to give you a hand through email and over the phone during normal business hours (see the contact link above).